Australian Aviatrix, Nancy-Bird Walton returned to Sydney after failing to obtain Government financial backing to continue her air ambulance service. She met up with a number of women pilots at an afternoon tea on the 10 May 1938. Other ladies there were Margaret Adams, Nancy Edwards, Dorothy McMahon, Thyne Reid and Helen Tout. They formed a sort of social club for female aviators. At the same time Nancy Bird and Margaret Adams were playing a major role in the formation of the Australian Women's Flying Corps (AWFC). "to make available to air-minded young women theoretical and practical flying training, together with instruction in first aid and other subjects, that would make the corps a valuable asset to Australia." "I do not think that flying - either commercial or for defence - is an part of a woman's normal role." "This heavy and arduous work must remain part of a man's domain." "They would be no good in the fighting zone . . . but they would be valuable in flying ambulance services, and transport and commercial work." The first meeting of what was initially called the "Australian Women's Flying Corps (AWFC)" was held with over 80 women in attendance in the Feminist Club of New South Wales at 77 King Street, Sydney on 6 July 1938. One of those women was Florence McKenzie who also established and directed the Women's Emergency Signalling Corps (WESC) in 1939. 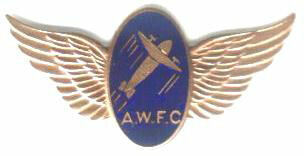 The name of the group changed to the "Australian Women's Club for the Encouragement of Aviation", then to the "Australian Association for the Advance of Aviation" and finally to the "Australian Women's Flying Club (AWFC)". The Annual Subscription for the AWFC was 10 shillings and six pence plus 1 shillings for attendance at the weekly meetings. After a short time operating out of the Feminist Club they established there own rooms at 8 Young Street, Sydney. Members were divided into Squadrons under a Squadron Commander. Betty Mullins resigned by February 1939 and Barbara Hitchins was elected as the new Secretary. As the threat of war increased membership of the club increased. Additional rooms were acquired at 9 Clarence Street, Sydney and Fort Street Girls High School grounds was used for parade drill and their hall was used for classes. Gwen Starke or "Starkie" as she was known, a well known Girl Guide member, and kindergarten teacher, was a Squadron Commander in the AWFC. She also served as President of the AWFC for a short period. Nancy-Bird Walton was one of the founding members of the Australian Women's Flying Corps (AWFC). Nancy-Bird Walton was also the New South Wales (NSW) and Australian Commandant, of the Women's Air Training Corps (WATC) from 25 July 1942 to 1 November 1944. The Australian Women's Flying Club (AWFC) and Women's Air Training Corps (WATC) were civilian organisations, which partly trained and fed the Women's Auxiliary Australian Air Force (WAAAF) with recruits throughout WWII. The uniform of the AWFC comprised dark blue serge tunic and skirt with forage cap, with a pale blue shirt, black tie, gloves and shoes. Members of the AWFC had to purchase their own uniforms. "The WAAAF in Wartime Australia"
I'd like to thank Ian Jenkins for his assistance with this web page.